130 new study spaces open in D Block! 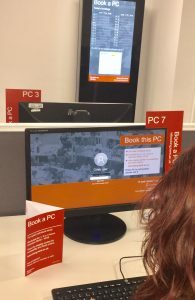 To guarantee use of a PC at a certain time there are now 24 bookable PCs in the Library. You can now book up to four weeks in advance using our new Book a PC trial service, which will run until the end of the summer term. The PCs are for quiet individual study and are located in new study space on Floor 2, D Block (the former PC room).